You also encounter Djinn, small creatures that enhance your combat abilities through stats and by releasing them, activating a power. 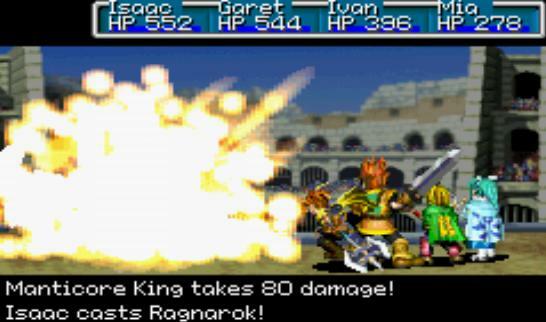 For example, during battle you can release a Djinn to damage and enemy, but you lose the stats that it provided you. Depending on the amount of Djinn released, you can summon a very powerful being that deals a ton of damage. Djinn are basically what adds variety to the combat. There are multiple strategies you can use to fight a boss. You can put your Djinn on standby before a fight so you can summon immediately, you can release each Djinn during battle and activate the abilities as you see fit, then summon for a finisher, you can simply keep the Djinn active and fight just using Psynergy, or you can use a combination. It adds a level of depth that no other turn based RPG replicates. Djinn can change you abilities as well. If you equip earth elemental Djinn to your Earth adept, then his abilites with strengthen for each Djinn equipped, and he might gain new Psynergy. However, if you attach a fire Djinn to the same earth Adpet, he will lose his stats and psynergy and take on completely different ones. You have to expiriment to find the right combination! 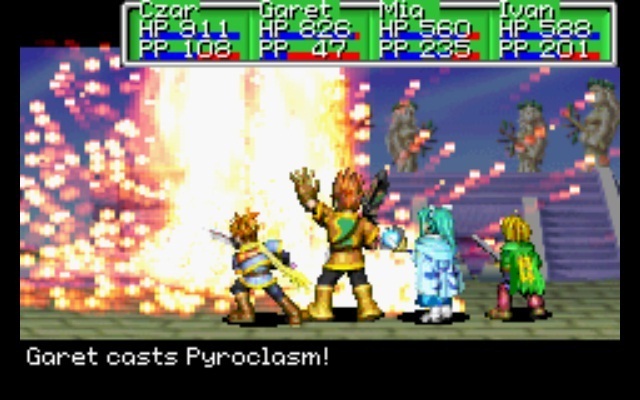 Overall, I would recommend Golden Sun to any fan of RPGs, or even just someone looking for a satisfying experience on the GBA. An excellent RPG to add to any collection. 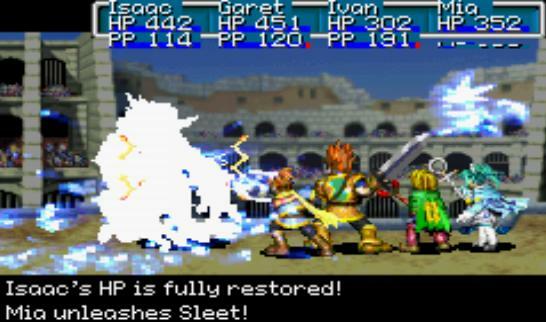 The gameplay of Golden Sun is very unique. I've played many RPG's but have yet to see anything like this one. 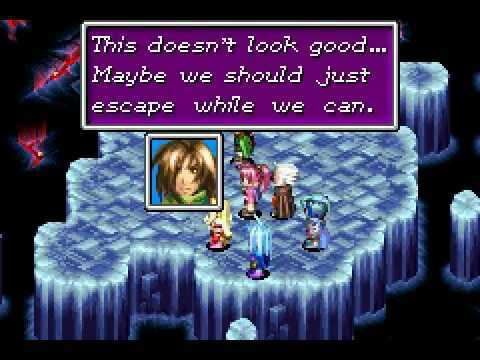 The use of Djinn alone is a very unique system (you find creatures called djinni along your quest and they help you in various ways) Also the puzzles that you have to solve in each dungeon seems to be uniquely to the Golden Sun series. I found this to be so cool, which made golden sun practically my dream game - the puzzles of Zelda and the RPG/storyline quality of Final Fantasy all in one. I have to say that this game was not as good as it's sequels. Personally, I felt that the story lacked as well as the gameplay. 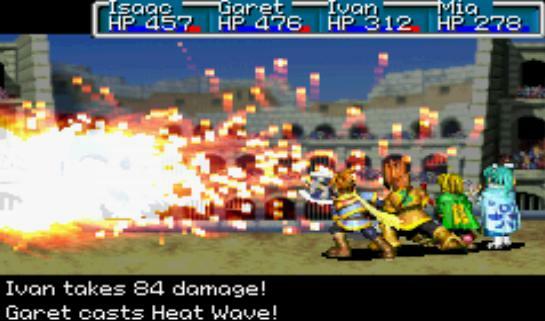 Also, this game is harder than both golden suns 2 and 3. I never found it overly difficult, and never had to stop and level up to progress, but some boss fights were rather challenging, and I got the game over screen several times (which, to be honest seems like in order to be a good RPG, you've got to see that at least that often). 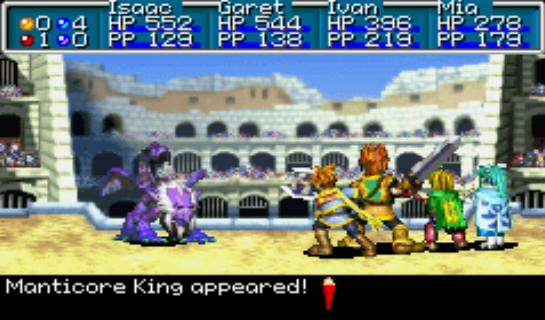 Overall, this was an excellent game and I would highly recommend it to any RPG or golden sun fan. 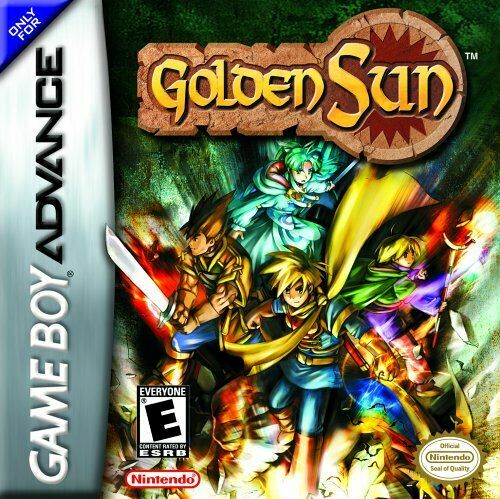 Golden Sun (U)(Mode7) is a Game Boy Advance game that was created and published by Nintendo. This game is about Issac and his allies, ready to fight in order to save the world from harm. 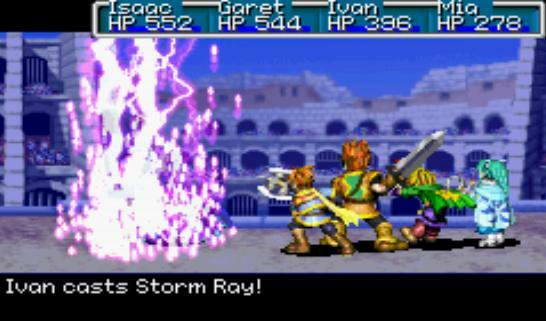 Ah, Golden Sun. 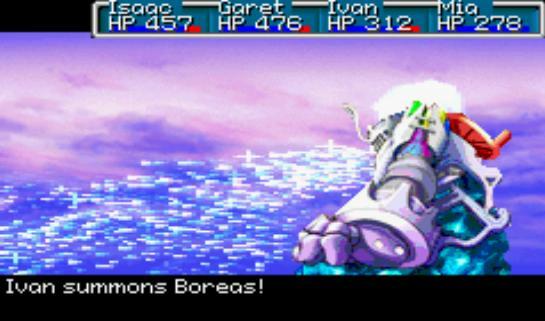 Probably the best RPG on GBA and one of my favorite RPGs of all time. The graphics, the soundtrack (Venus Lighthouse theme especially), and the story add up to create a fantastic RPG. Golden sun, where to begin with this game? 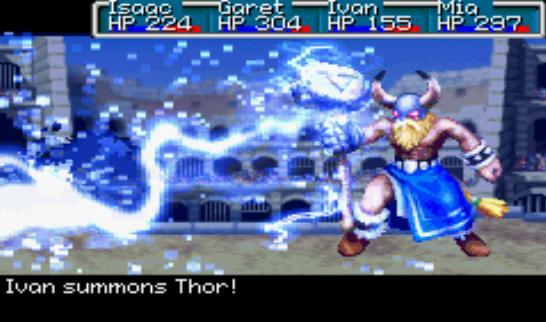 This is truly an epic rpg on the gameboy advance and very thought out. I wont spoil anything for the story as there are plenty of videos that do that already, however to fully grasp it you need to play it yourself. In the game you play as issac or whatever you choose to name him and you have creatures called djinn which you can summon and use to help during battles. Depending on the number of djinn or where you place them have an effect on battle, wheather you live or die depends on them though not so much early in the game. Battles are turn based and you can equip certain weapons to certain characters, like one can have a staff but someone else cant carry it. One downpoint of the game is each character can only hold a certain amount of items but dont worry, if you think wisely you will always have room for more. Read all 7 reviews for Golden Sun (U)(Mode7) Submit your description for this title! Now you can add videos, screenshots, or other images (cover scans, disc scans, etc.) 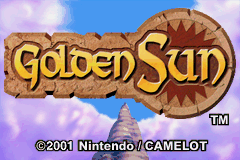 for Golden Sun (U)(Mode7) to Emuparadise. Do it now! 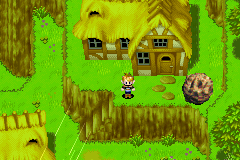 You have the option of playing Golden Sun (U)(Mode7) in your browser, right here at EmuParadise! No need for any software, no installations required, all you need is a fast enough PC and a browser with Flash support. This is great if you're on a PC with restrictions on software installations or want to secretly play at work. | first and save the world.